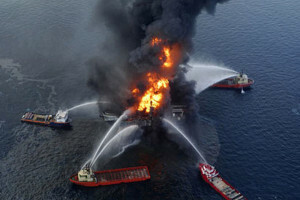 The explosion aboard the Deepwater Horizon kept British Petroleum’s flagship oil drilling rig in flames for days before it sank to the bottom of the Gulf of Mexico. This catastrophe is recreated in the opening scene of my thriller THE FURY. A MULTIMEDIA GIFT TO YOU! Some days you receive a gift you love so much you can’t wait to present it to the world. This is one of them. It’s an audio file created by multimedia artist Lavell J. Reed Jr., who liked my latest thriller novel, THE FURY, so much that he created this hyper-cool narration of one of the early scenes in the book. But it’s not just a dry recitation of my words. It’s an entire world come to life through multi-media art. Listen to Lavell read. Feel the throbbing musical undertone. Hear the crashes, screams, bullet strikes, panic, screeching of brakes; all the terrible glory that is the heroic fight of good vs. evil. It all comes together in this audio file. Thank you, Lavelle, for making this two-minute epic and allowing me to post it on my website and social media. I’m proud to share your pro-level work with the thousands of friends and readers I have around the world. And a tip of the cap to Hanley E. Kanar, a professor at the Illinois Institute of Art, who suggested to Lavell one day last year that he might like reading this book. From that suggestion came multi-media magic. I predict a long and exciting career ahead for Mr. Reed . . . and a devilishly fun listen for you. Enjoy!